Jakarta Vice Governor, Sandiaga Uno opens training for 5,000 sport teachers from 3,000 schools in Jakarta. This training is held by America National Basketball Association (NBA).
" We are very welcoming this activity"
"This is world-class cooperation between Jakarta Provincial Government and NBA. NBA's approach and training are very good. We are very welcoming this activity. Basketball trainers are also from America," he said when opens training at Ciracas GOR, Wednesday (1/24). Meanwhile NBA Associate Vice President of Marketing Partnerships, Jim Wong added, Jr. NBA Coach Academy purpose is to develop basketball sport through field training, strengthening and physical conditioning. 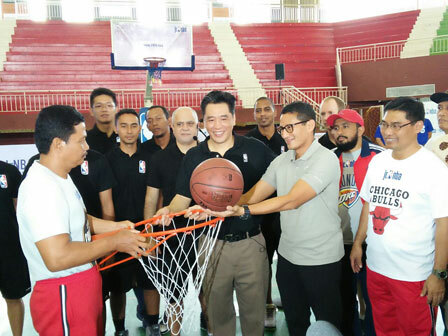 "Starting today, NBA and Jakarta Government will hold 10 daily training sessions. It will last until second week of February 2018," he informed.